Some hunters enjoy making their own gear like building arrows or natural ground blinds. If you'd like to add apparel to your DIY list, here's how to make a ghillie suit. In a recent telecast featuring Dale Earnhardt Jr. and Martin Truex Jr. talking deer hunting, Truex called himself a tinkerer. He likes to sit around and make stuff like his own arrows for bowhunting. One might argue that many hunters gravitate toward the art of tinkering, which is why they often make stuff to use on their hunts, like arrows or ghillie suits. Perhaps that's because hunting, like tinkering, requires patience and the patience is arguably drawn from a well of appreciation. A hunter appreciates the rhythms of nature. Meaning, he can appreciate watching a carpenter ant climb up and down a birch tree, doing its work, steady as she goes, for over an hour or more while waiting for a bruiser to cross his path. Now that we’ve established that hunters and tinkers are sometimes part of the same distinct club, let’s examine the cousins of tinkers. Cousins of the tinkerer may be whittlers, reloaders, fly tiers and arrow builders. If you’re one of these people, then you understand why some hunters are motivated to make their own ghillie suit. If you are a hunter AND a tinkerer, then you probably ARE one of those people motivated to make a ghillie suit. If you think the DIY aspect is dumb but find yourself wondering why ghillie suits are awesome, swipe down. Go to www.ghilliesuitwarehouse.com and order the Synthetic Ghillie Poncho Kit or purchase supplies at your local craft or sporting goods store. You also can recycle old camouflage shirts, pants, jackets, burlap, camouflage netting, etc., but they will not be as lightweight as synthetic jute. Create a poncho that will fit over the vest you are camouflaging. Add sleeves if you want more cover of your arms and a hood to cover your head. Secure netting to your vest using fishing superline (braided Kevlar, fused line or micro Dyneema) threaded through a heavy-duty needle and sewn on a regular pattern covering the vest. Choose strands of colored jute, strips of burlap or strips of netting to create a camouflage pattern that closely matches your hunting area and season. Use only four or five strands of jute at a time. If you are having trouble figuring out color, match the color pattern and color proportion on the vest. If the netting lies on a patch of green on the vest, knot a patch of green jute/fabric/burlap to match. Don’t tie knots on every strand of netting, leave gaps and don’t get into a habit of tying a particular pattern of colors. Random colors will work best. Take your time. Expect this project to last many hours, even days, as there will be up to 3,000 knots. 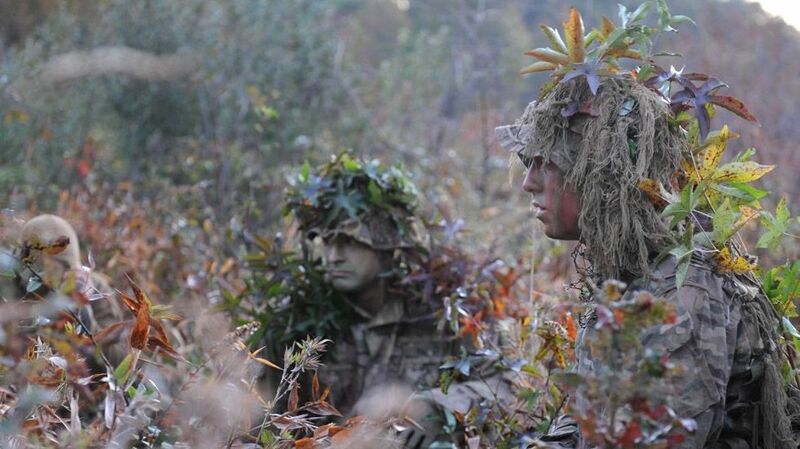 Military personnel, particularly snipers trained at the U.S. Army Sniper School at Fort Benning, Georgia, rely on the ghillie suit. Ghillie suits are also worn by others,4 including hunters and law enforcement personnel whose success requires concealment. Soldiers at the Sniper School are even taught to make their own ghillie suits, which are ultimately tested for durability by requiring soldiers to crawl through ditches filled with water, mud, rocks and fallen branches. The suits are critical to a sniper’s concealment providing a three-dimensional breakup, rather than one that’s linear. Plus, the ghillie suits should move in the wind in the same natural way surrounding vegetation does, which is another benefit. Highly flammable and often made using jute and burlap, the U.S. Army developed a fire-resistant, self-extinguishing fabric for use in its ghillie suits. These suits become standard issue for U.S. Army Snipers in 2008. But while the U.S. military has set the standard for ghillie-suit tech, this camo style first originated as a portable hunting blind to aid hunters and gamekeepers in Scotland, according to Out of Nowhere: A History of the Military Sniper written by Martin Pegler. The book reference was cited by Wikipedia in their written history of the ghillie suit. While ghillie suits optimize concealment, the suits do tend to be extremely hot and, if not accustomed to wearing one, they can incumber movement.